Wash and clean the gourds. Cut the head and tail ends of each gourd. Then cut the gourds into thin slices with a sharp knife. Take a microwave safe bowl and add the cut gourd pieces. Add 30ml water to the gourd pieces and place the bowl in microwave oven and cover it partially. Cook the gourds on high power for 5 minutes. Stir once and place the bowl in oven and cover it partially. Now cook the gourds on 50% power for 7 minutes. Stir once again and place the bowl in oven and cover it partially. Now cook the gourds on high power for 5 minutes. Test the doneness by pressing it between fingers. Wash the green chilies and grind them coarsely in a mixer grinder. Heat a pan and add oil to it. When the oil is hot add the black gram and fry stirring till the seeds start changing color. Then add mustard seeds and cumin seeds. Fry till the seeds splutter and add the coarsely ground chilies and curry leaves. Fry the seasoning well and add turmeric powder. Mix well and add the cooked gourd pieces. Mix all well and add salt to the curry. Mix again and cook covered on low flame for 2 minutes stirring once or twice in between. When the curry is done switch off the flame and add lemon juice to the curry and mix well. Transfer the curry to a serving bowl and serve hot. While selecting ivy gourds, take the tender ones, as they have a special natural sweet taste. The gourds with seeds and are red inside will be sour to taste. Cutting the vegetable in even and thin slices enhances the taste through looks. Green chilies may be replaced with red chili powder—but the color of the curry changes. To keep the curry in green color I have added green chilies. 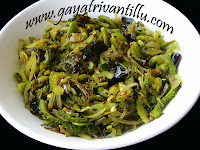 Green chilies when used by chopping them into big pieces may cause problem while eating the curry. As it will be difficult to identify the green chili in the green colored curry, it is better to grind them and use to avoid segregation. Green chilies, salt and lemon juice may be adjusted according to ones taste. Microwave cooking times may vary from one machine to other. Cook till there is no rawness in the vegetable. Cooking a vegetable in a microwave oven will not make it mushy (even if it is cooked for a long period) if just sufficient water is added to cook the vegetable. The vegetable will retain the shape even when cooked for a long period. That is the great advantage of using a microwave oven. For people who are not oil conscious, may use 6tsps of oil and prepare this curry. After cooking the vegetable remove the lid and stir fry for few more minutes to get a fried version of the curry. Stir frying the vegetable makes it crisp giving the curry a fried taste. The extra oil used will allow the curry to fry and enhance the taste. Add rice to the curry and mix in the pan itself to get tasty fried rice type rice. The oil along with the spices adhering to the pan will get mixed up with the rice and gives it a nice taste. Ee Koora ni ma aavida chesee natte undhi kaani meeru fresh kobbara veste inka baaguntundi, yemantaru? 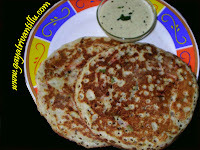 u r a amazing cook.ur videos are easy to undrstand mee valla i started liking dondakaya koora. 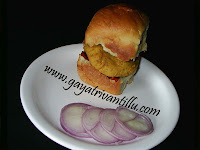 gayatri vantillu is one spot for all andhra cuisine. ur a big help to students like me living abroad.